Providence Water's drinking-water system, in fact, is one of the largest in the country to routinely exceed federal lead standards — 57 percent of the time during the past decade. 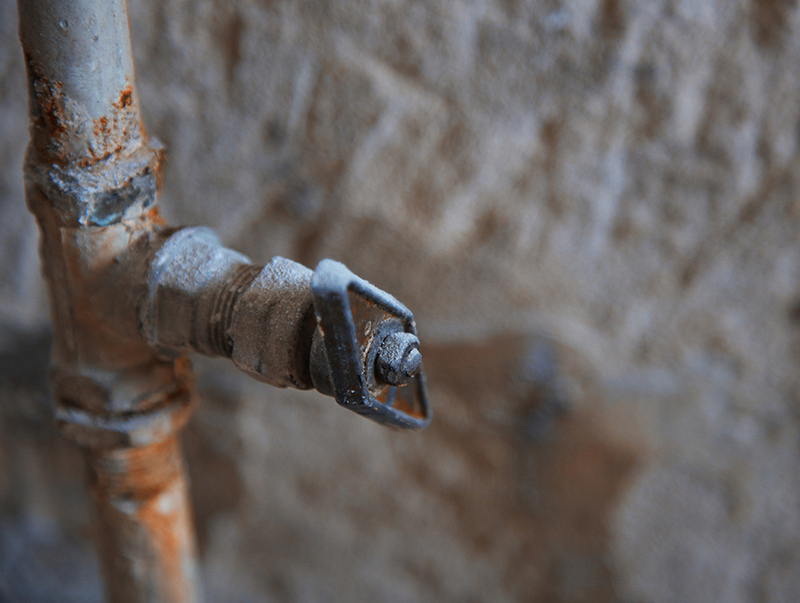 Federal law requires that if more than 10 percent of sampled high-risk homes have lead above 15 parts per billion (ppb), water utilities must immediately notify customers and take additional action, such as preventing corrosion that causes lead leaching. When the systems of lead pipes that run under cities such as Providence, New Bedford and Fall River were first installed, many people didn’t know about or understand the dangers of lead poisoning. As a result, lead remains the primary connection for water running to older homes. The fix is complicated, and expensive, as copper piping is the replacement. Since 2007 Providence Water, which supplies about 60 percent of Rhode Island with its drinking water, has exceeded Environmental Protection Agency (EPA) Lead and Copper Rule action levels 12 out of a possible 21 times. The EPA requires utilities to test their drinking water once during two annual semesters: January through June and July through December. Providence Water has met the standard four out of the past five semesters. During the past 10 years Providence Water’s highest recorded level of lead was 30 ppb, during the second semesters of 2009 and 2013. The lowest level was 9 ppb, in 2015’s first semester. It’s not an easy job when no one knows where all the lead pipes, fixtures and solders are. Providence Water is hardly the only utility battling lead. Since 2013, some 1,400 water systems have reported excessive lead levels of more than 15 ppb at least once, according to the EPA. Among the cities that have faced this problem are Fall River and New Bedford, Mass., Pittsburgh, Pa., and Washington, D.C.
More than 18 million Americans got their drinking water from systems with lead violations in 2015, according to the Natural Resources Defense Council (NRDC). Last year’s report noted that 90 percent of these water-rule violations never faced any formal enforcement. In fact, states and the EPA sought penalties against only 3 percent of these lead-rule violators. A few years ago, to get a better handle on the lead problem, Providence Water tripled the amount of high-risk homes it is required to test per semester. The utility now tests 300 homes twice a year in Providence, Cranston, North Providence, Johnston and older sections of other serviced neighborhoods. Water to be tested is supposed sit in the pipes for at least six hours, and the water taken should be from first draw. This protocol, however, isn’t always followed or adequately relayed, which can produce more positive results. The source for Providence Water is the Scituate Reservoir, and the water is delivered through some 1,000 miles of mains. The water at that point is lead-free. The problem starts with the service lines, from the public main to the curb and from the curb to homes and businesses. Many of those service lines, both public and private, contain lead. “There’s no lead in the source, or coming out of our purification and distribution systems,” Caruolo said. Antiquated infrastructure and old plumbing are the main culprits, but it’s a multilevel problem. Some 13,000 homes — about 17 percent of Providence Water’s 75,000 retail customers — are still serviced by utility-owned pipes made of lead that connect the public water main to private property, according to Providence Water. Many of those homes, and plenty of others, likely contain lead pipes, fixtures and/or solder. Providence Water estimates another 25,000 or so private-side lead service lines remain in use within its service area. The cost to replace a lead service line is about $2,000 to $3,000 — a ballpark cost of about $95 million to replace the 38,000 or so lead service lines within Providence Water’s retail district. That estimated cost doesn’t include lead soldering, fixtures and other hidden sources. If a home or building, for instance, was built or plumbed before 1983, it could have lead-soldered copper pipes. Caruolo estimated that it would costs hundreds of millions to remove all lead, both public and private, from the utility’s water system. All this lead plumbing is playing a part in Rhode Island’s higher-than-average blood lead levels. In 2010, Environmental Health Perspectives reported that the state had three times the U.S. average number of children with blood lead levels above the “level of concern” at which the Centers for Disease Control and Prevention (CDC) recommends intervention. Activists, such as Laura Brion, and Donald Pryor, believe Providence Water, the Rhode Island Department of Health and the state should be doing more to replace lead service lines. Brion, executive director of the Providence-based Childhood Lead Action Project, said Rhode Island’s lead legacy includes drinking water. She said the state lacks a comprehensive plan to eliminate lead in drinking water. Pryor, a lecturer at Brown University’s Center for Environmental Studies, said he has been told “lead in water is about 20 percent of the problem when it comes to lead poisoning in Providence.” He believes the public hasn’t been well notified of the problem, or adequately educated about how to deal with it. He said Providence Water offers property owners little information about eliminating private-side lead service lines and even less encouragement to do something about it. Childhood lead poisoning has gone way down, but it’s still about 13 percent, according to Pryor, a Providence resident who has worked for the National Oceanic and Atmospheric Administration and for the White House Science Office. Despite substantial improvements in prevention of childhood lead poisoning, nearly 1,000 children in Rhode Island are still poisoned annually. Lead exposure can affect nearly every system in the body and, because such exposure often occurs with no obvious symptoms, it frequently goes unrecognized, according to the CDC. Lead poisoning exposes children to brain and nervous system damage, slowed growth and development, learning and behavior problems — i.e., reduced IQ, attention-deficit/hyperactivity disorder, juvenile delinquency and criminal behavior — and hearing and speech problems. The impacts are irreversible. Lead in water, though, is the part of this public-health problem that is often overshadowed by the more publicized aspects: lead-laced paint, soil and dust. While Rhode Island health officials note that these sources are bigger contributors to elevated levels of lead in children’s blood, they don’t discount the threat posed by lead in drinking water, especially when no level of lead exposure is considered safe. In April, Providence Water and the Department of Health signed a bilateral compliance agreement that included an orthophosphate treatment pilot project — at the Fruit Hill pump station in North Providence — to determine its effectiveness as a lead corrosion inhibitor. To maintain the system’s elevated pH level, a second chemical, most likely sodium hydroxide (also known as lye and caustic soda), will be added to counteract the effects of orthophosphate. Since 2012, Providence Water has raised the pH of its water — adding phosphorous is a common practice — to initiate reactions that minimize lead corrosion. When water interacts with build-up inside pipes, it results in the increased or decreased leaching of lead. Swallow noted low-interest loans, grants and point-of-sale requirements — i.e., the Rhode Island law that phases out cesspools — as ways to address the removal of lead infrastructure. “It’s not an easy problem to correct,” she said. The problem with lead in drinking water, however, constantly takes a regulatory back seat, especially when it comes to rental units. For instance, any lease requires a lead disclaimer in the case of paint, but not water. Also, there is no legal requirement for landlords to regulate lead in water, or even inform their tenants of a potential problem. A legislative commission enacted last year by the General Assembly to investigate lead contamination in Rhode Island drinking water has never convened. The commission is tasked with conducting a study to determine the presence of lead in state drinking-water supplies; to examine the condition of drinking-water supply infrastructure and the efforts by suppliers to mitigate lead risk in their systems; and to look at the financing options available to utilities and property owners to access low-cost financing to repair/replace pipes and related infrastructure. Its report to the House of Representatives is due Jan. 2. Childhood Lead Action Project's Brion said the EPA’s Lead and Copper Rule action level is too high and the political will needed to solve the problem too low. Providence Water’s website features an interactive map that allows users to find lead public and private service lines. ecoRI News recently sat down with Providence Water’s top three officials — Caruolo, deputy general manager Peter Pallozzi and executive engineer Gregg Giasson — to discuss the lead problem. All three of the Providence Water officials noted that replacing a public-side lead service line doesn’t make sense if the private-side lead service line isn’t removed. The lead problem remains, and could possibly be worsened, as partial service line replacement can cause lead levels to spike. In 2010, Mount Hope, a neighborhood in North Providence, dealt with the issue of partial replacement. Providence Water has since halted the program of mandatory partial service line replacements. “If customers want to replace their lead service lines, we will replace our side,” Caruolo promised. To address the lead problem, they advise customers concerned about possible lead contamination to let faucets flush until the water gets cold. They say customers should routinely clean or replace their faucets’ aerators, where lead particles can accumulate. They recommend using filters certified to remove lead. Education and increasing public awareness also play important roles. Providence Water employees hand deliver information packets to homes, doctor’s offices, day-care centers and schools in high-risk areas. Caruolo visits schools in September and October to talk to students about lead poisoning. Providence Water also plans on spending between $15 million and $20 million annually on water-main rehabilitation. The utility owns some 550 miles of cast-iron water main — some sections a century or more old. Providence Water’s advisory panel — Marc Edwards, a civil engineering/environmental engineer at Virginia Tech who helped bring the Flint, Mich., water tragedy into focus; Abigail Cantor, a chemical engineer specializing in water-quality investigations and founder of Process Research Solutions LLC; Stephen Estes-Smargiassi, director of planning and sustainability at the Massachusetts Water Resources Authority; Daniel Giammar, professor of environmental engineering at Washington University in St. Louis; Michael Schock of the EPA’s National Risk Management Research Laboratory — has told the utility that there could be a link between the release of iron from unlined cast-iron mains and the presence of lead at customers' taps. Both Providence Water and the Department of Health offer affordably priced testing to determine lead in drinking water. Providence Water also is launching a pilot program that is offering 3-year, zero-interest loans for homeowners to replace their lead service lines. If a homeowner replaces the private side of the service line, Providence Water will automatically replace the public side. Despite these programs and initiatives , concerned resident and Providence Water customer Pryor remains baffled by the state’s inability to effectively address the problem. He doesn’t buy the too-expensive argument.